Last year, Asus’s ZenWatch 2 was a really great and eminently affordable Android Wear device. This year, Asus is back with the ZenWatch 3, and it is addressing the pathetic battery-life problems that have plagued smartwatches for years. The ZenWatch 3 promises two days of battery life. It’s straight-up sad that in 2016, we’re still excited by a smartwatch that can last have battery life of more than a day. Even cooler, the watch charges incredibly fast. It takes just 15 minutes to get a 60 percent charge. We really wish that we lived in a world where most smartwatches could last days on end but until we get to that point, fast charging is a nice compromise. If you really need more battery life, Asus offers an optional battery pack. I’m not a huge fan of that, mostly because it adds bulk, but good on Asus for looking out for power users. Like last year, the ZenWatch 3 is IP67 water resistant, so if you get caught in a rainstorm, you should be OK. Just make sure you don’t fall in a pool or your fancy watch will die. The ZenWatch 3 also sports a new round design, which is a departure from the garish square design of previous models. It’s available in three different finishes, including my personal favorite, rose gold. The watch is quite thin too. It’s just 10mm thick, which while meatier than the Pebble Round is still thinner than the Apple Watch or the ZenWatch 2. And from the press photos, the bezel around the face is nice and narrow, so that’s a plus. 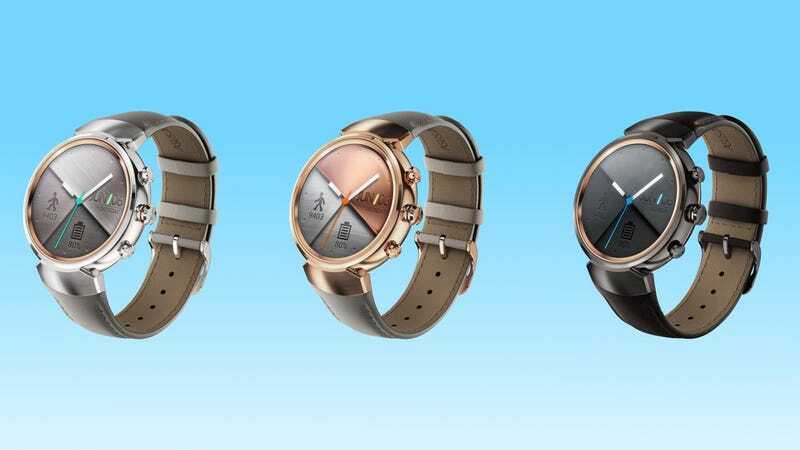 The ZenWatch 3 will be available later this year for $230.